October has been a tiring, but wonderful month for me. I’ve been so lucky to travel quite a bit lately. 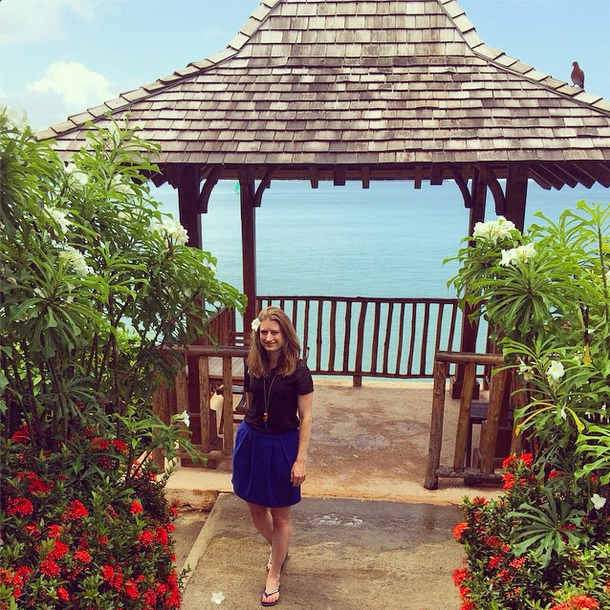 The first 10 days were spent in Saint Lucia on the remaining days of our honeymoon. I’ll be sharing some more stories on the blog over the next few weeks, but if you’ve missed what I’ve written already, check out Marina’s breadfruit pie, the cocoa plantation tour and lunch at Hotel Chocolat. Back in London for about 10 days after that, I did a lot of playing catch up and getting ahead of myself at the same time. There wasn’t time to cram in too much but I spent a bit of time enjoying the crunch of leaves in Hyde Park and took an hour walk all the way up to Marylebone to pay a visit to my favourite bookshop, Daunt. Like I mentioned last month, I’m taking over my the social media for dad’s small business, Sadler Garden Collections, for a while, so if you like gardens, birds and pretty things for outdoors, come follow along on Pinterest,Facebook and Twitter. Then I hopped on another plane and flew over the other way to Athens (having just adjusted back to London time) for TBEX. I can’t tell you how inspiring it is to be in one place with 800 travel bloggers. Athens itself has changed a lot and though I had little time to explore, I fell a bit more in love with it this time. It’s a wonderfully gritty city that has, like London, something fascinating around every corner. I’ve shared one post about the 46 stray cats I photographed, but there will be a few more posts to come. I’m thrilled to be back in London for a bit as I have some projects I want to dig my teeth into. How about you? Did you have a memorable October? 1. An Airbnb House in St. Lucia. We spent the first half of our honeymoon with this view. 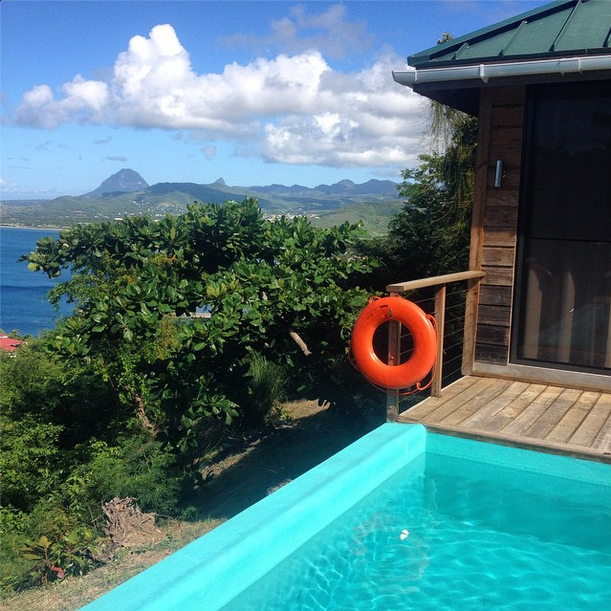 Far from the huge tourist resorts, we rented an Airbnb house with a private plunge pool, a big wooden deck with lounge chairs and a view over the sea down on the southern tip of the island in Vieux Fort. It was pretty isolated and came with Marina who cleaned a few days for us and taught me how to make breadfruit pie (see link above) which was probably one of my favourite experiences from the whole trip. 2. Balenbouche Estate, St. Lucia. Not too far up the west coast of the island from where we were staying was the stunning Balenbouche Estate which recommended to me by my flickr friend and fashion photographer Frederique Rapier who has friends there. The owners weren’t able to give us a tour as the whole family was battling the mosquito bourne disease Chikungunya. We found ourselves on the grounds of an old estate with a map and a dog who followed us around. 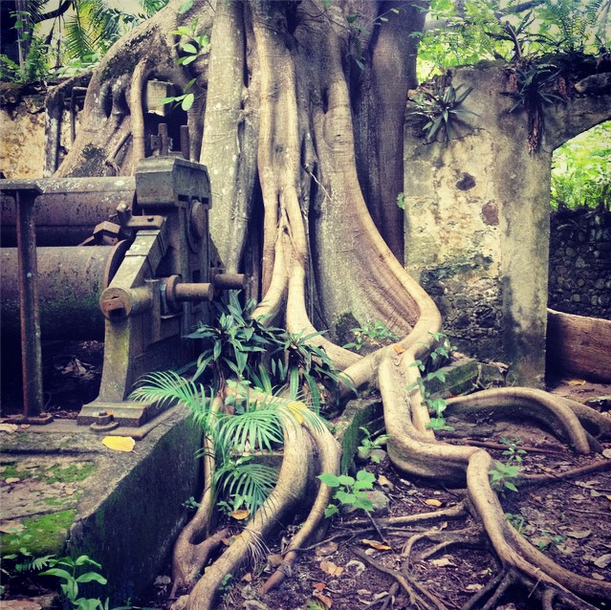 This overgrown mill hidden in the depths was simply magical. 3. Fruit in St. Lucia. One of the best things about a tropical holiday is the fruit! I love to taste the different flavours that we don’t have back home. 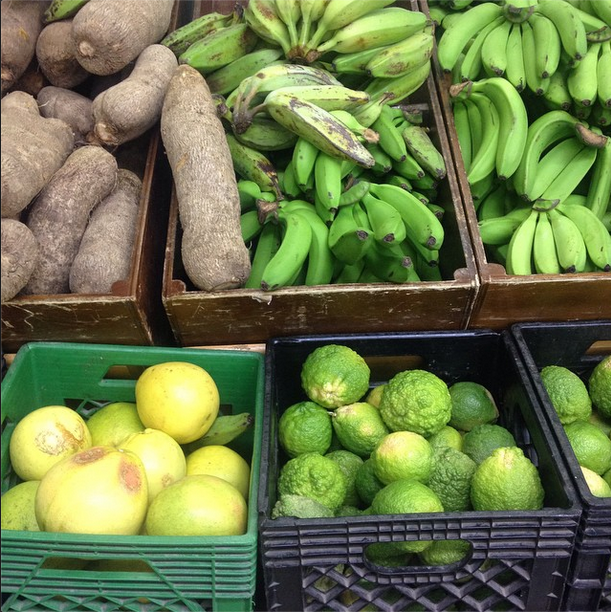 We even found mamones which I used to eat when I was living in Colombia. We would sit on the beach biting into their soft shells and biting the flesh off of the stone. This was a display in one of the supermarkets in Vieux Fort. We were the only tourists in sight. 4. Hotel Chocolat, St. Lucia. One of the best meals we ate was on the beautiful veranda of the Boucan Restaurant at Hotel Chocolat on the cocoa plantation overlooking one of the island’s famous pitons and a sea of green. I wrote about our meal a few weeks ago and shared quite a few photos of the delicious food. This photo was taken after we ate, in the entranceway. We’re looking relaxed, no? 5. 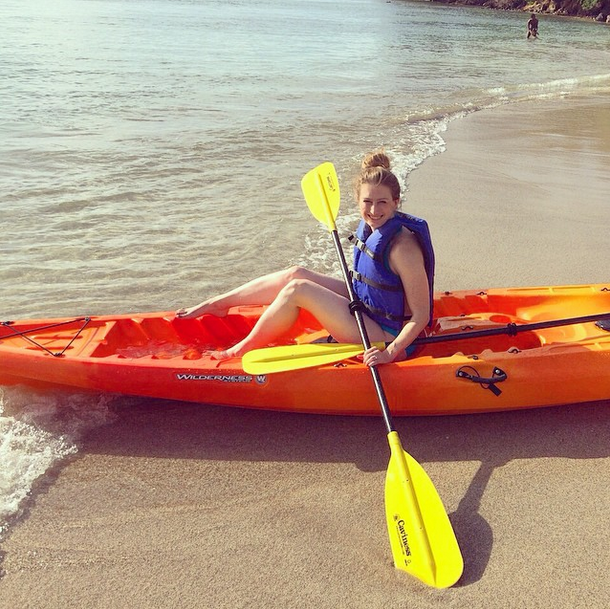 Sea kayaking in St. Lucia. One of the coolest things we did while staying at a small resort up north was sea kayaking. The kayaks were just sitting on the beach, first come, first served. We took this one out a couple of times. The sea is so smooth, it’s almost like kayaking on a lake, unless a boat goes by, of course. The weather was hot and humid the whole time so it was pretty hot on the water. I think I put sunscreen on about 3-4 times every day since I am a ghost and burn in an instant. 6. 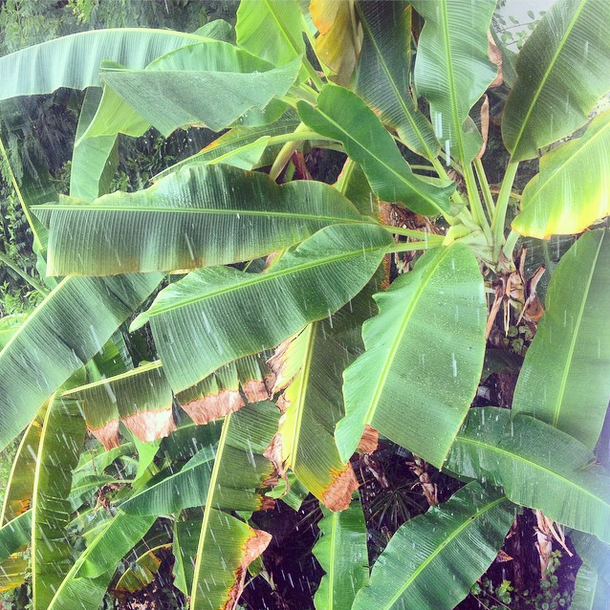 Rain in St. Lucia. We were really lucky to have chosen to travel during hurricane season and only have a few storms. They were actually very welcome and we were able to watch them from the restaurant veranda. The storms we did have were pretty short but powerful. I love watching the rain, especially thunderstorms, and they cooled the balmy air down slightly as well. I took this on looking down on a palm tree while we were eating lunch in the restaurant. 7. Calabash Cove, St. Lucia. We had a little ocean cottage where they splattered rose petals around every day (which is a bit cheesy for me, but the view from our porch was stunning and we had our own pool again which made Jorge very happy). It was a small resort and our cottage was pretty isolated which was perfect. This was taken after the rain in a central area of the resort. I like that it was photo bombed by a a random tropical bird at the top right. 8. Dennery in St. Lucia. Heading back down to the south of the island to catch our flight back to the UK, our driver took us down the east coast this time and stopped for a few photo ops along the way, like an incredible hand-painted rasta house and this little view point. 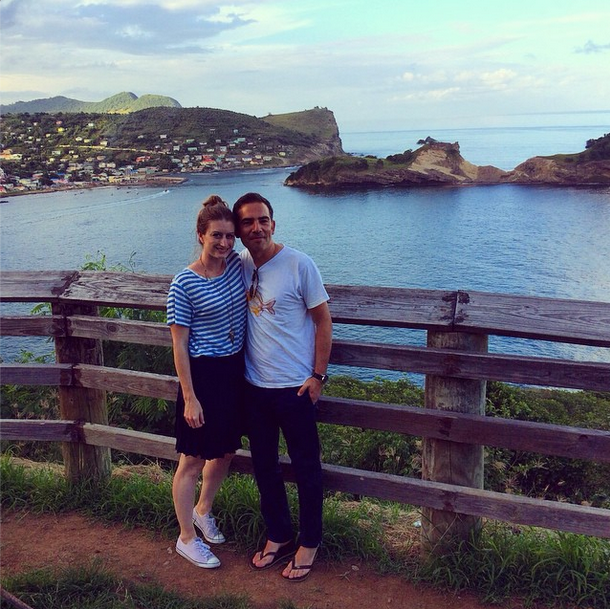 Behind us is a little village called Dennery and the small island closer to us is, according to our driver, home to a rare lizard…maybe next time. 9. Hurricane essentials, St. Lucia. 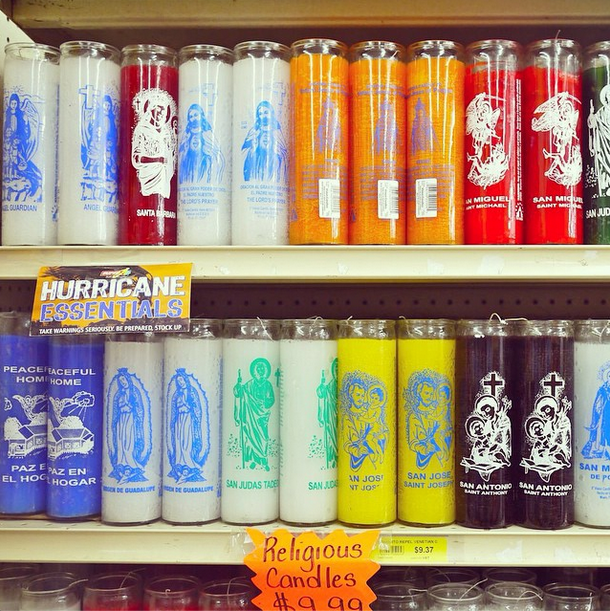 I couldn’t resist this photo of religious candles promoted as “hurricane essentials” in the Vieux Fort supermarket. Candles as hurricane essentials are pretty obvious but the fact that they were specifically candles with saints on them amused me. It is quite a religious island so it makes sense, but cultural differences like this are endlessly fascinating. I’m not sure whether or not they were scented ot not. 10. British Airways. It was a real treat to be able to fly business class to St. Lucia. 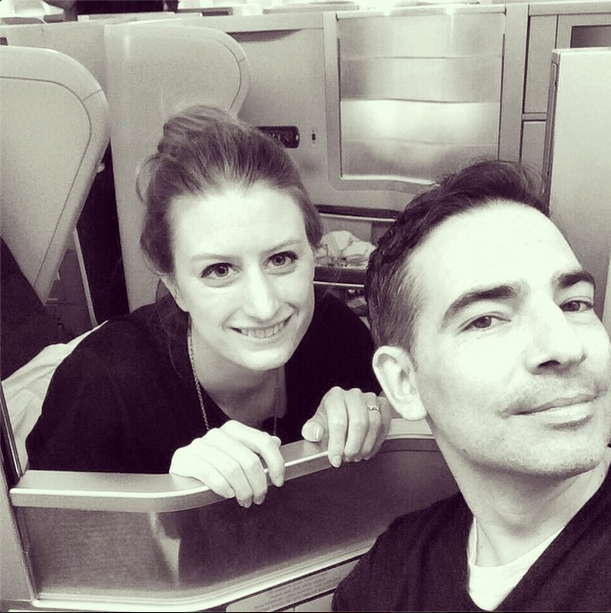 Having points with British Airways meant we could upgrade and it was a luxury that we obviously can’t usually afford. You get a glass of champagne or orange juice before the rest of the passengers even board, hot towels, a menu to choose your meal which is a starter followed by a main, followed by a desert, all served separately on real plates with real cutlery. The seats reclined fully to beds and everything was just generally much more awesome than flying economy. As you would expect. 11. Oakley. This is Oakley at about 8 months. He’s looking like a proper adult cat now even though he does have a bit more growing to do. Looks like trouble, right? 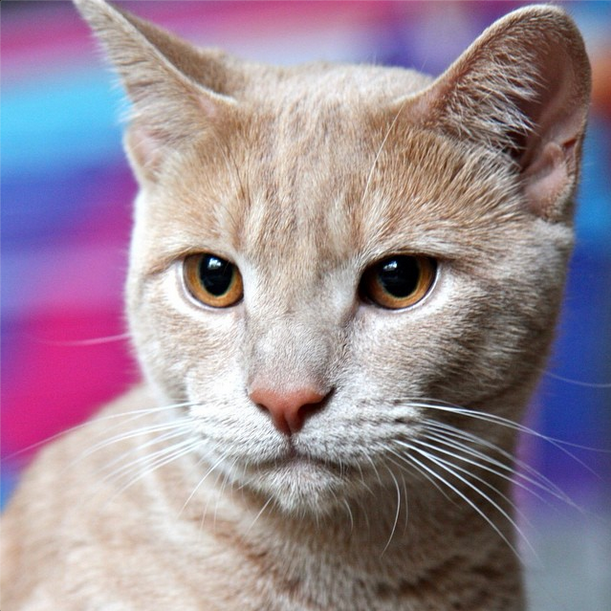 He has very serious eyes, always on the lookout for something, always exploring and chasing and doing the playful things that kittens do. He does occasionally curl up on my lap for a nap but it never lasts very long! 12. Rainy day in London. Yes, back in London and greeted by the rain. It’s that time of year, so I expect it and actually enjoy it unless it carried on nonstop for weeks on end which sometimes happens in the winter. This was on my walk home from work in a mews in South Kensington. The wet cobblestones were glistening and the leaves were dripping. Autumn is in full swing. 13. Autumn leaves in New York. There is nothing like Autumn in New England. 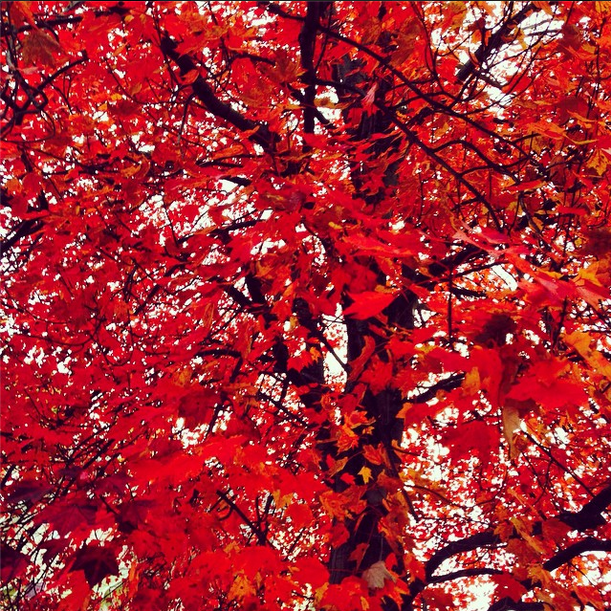 My mom sent me this photo from our garden, a maple tree that turns a fiery red year after year. 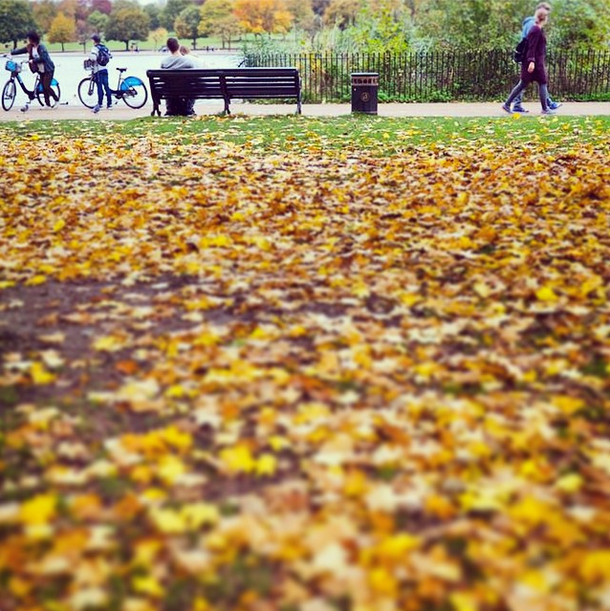 There really is nothing like it in London that truly compares to the vibrancy of Fall back home. It’s the season I miss more than any other for that reason. The photos that come out of the month when the leaves are at their peak are always stunning. 14. Autumn leaves in London. 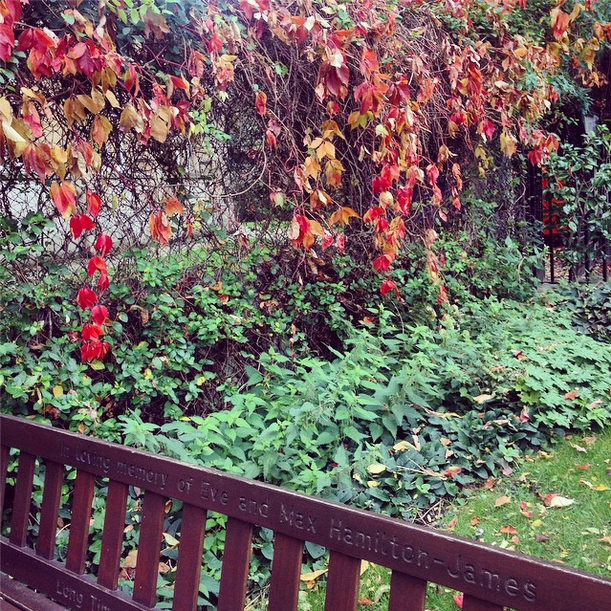 The leaves fall in London too, and they are beautiful as well, but in a different way. Rather than red and oranges, they tend to be more yellows and browns. 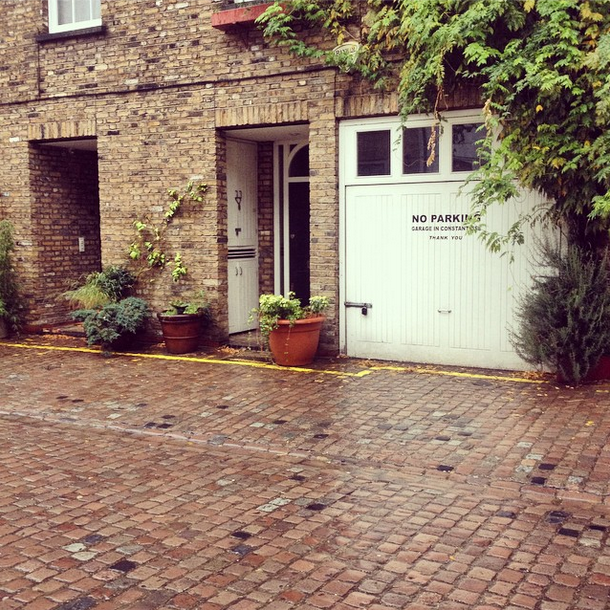 I took this photo in St. Luke’s gardens in Chelsea on a wet afternoon. 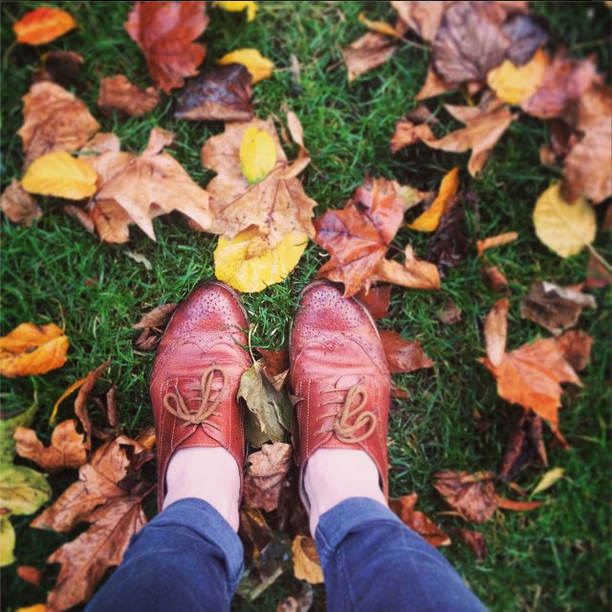 I finally got my brogues re-soled and they are weather-appropriate this time of year. 15. Fall foliage. Another one from St. Luke’s gardens, I loved the way the leaves were draped over the wall and the fact that they look so colourful while the folliage below is still a near summer green. And I also love readng the inscriptions on park benches (although this isn’t one of the most interesting) so I thought I’d include that. It’s a beautiful park to just sit and read, enjoy a cup of tea from Paul down the street and watch the dogs and kids expel their energy running through the grass. 16. Strange dog. You come across some random stuff walking around London. At first glance, you’d probably think this was some sort of joke on an East London wall, but I actually spotted it in a wealthy residential Knightsbridge neighbourhood which makes me wonder if it was put up in seriousness. 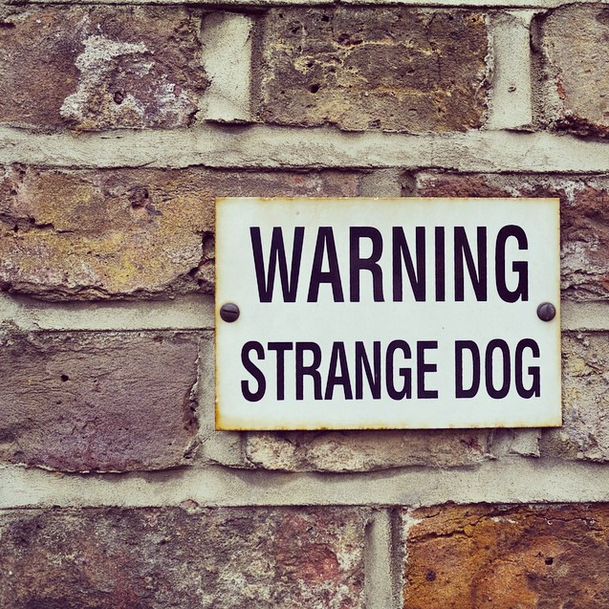 Seems an odd choice of wording and makes me wonder what makes for a strange dog anyway… any ideas? Someone one Facebook told me he’d like this on a t-shirt. 17. 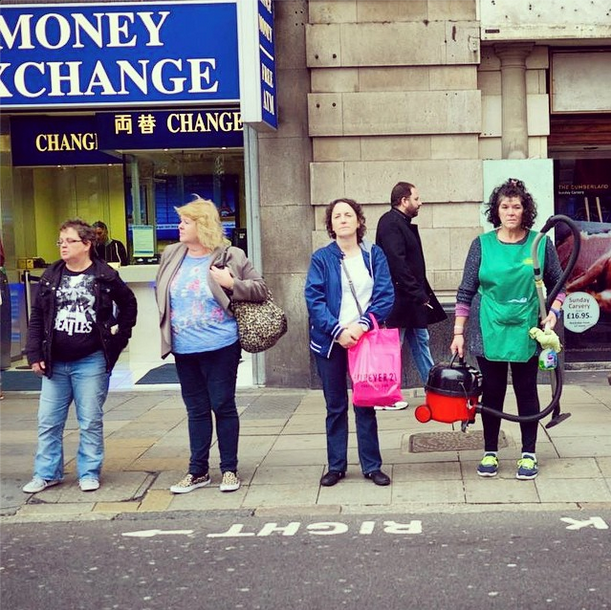 Crossing the street, London. On my walk up to Marylebone one day, I wandered across Hyde Park and through Marble Arch, an area of the city that I really dislike. It’s at the edge of busy Oxford Street, a bland square (apart from the cool horse statue) riddled with a million pigeons, beggers and tourists with suitcases. There’s heavy traffic around all sides and it takes ages to cross. But at least this scene was entertaining. 18. Hyde Park, London. I love an Autumn walk through Hyde Park, a place that takes me back to my study abroad days when we lived across the street and fed the swans in the serpentine and took shelter under the willows when it started to rain. It’s pretty this time of year, the ground blanketed in yellow leaves, horses trotting through the sandy paths and people taking the time to stop and be in the moment. 19. Saying goodbye. Before long, it was time to pack again. 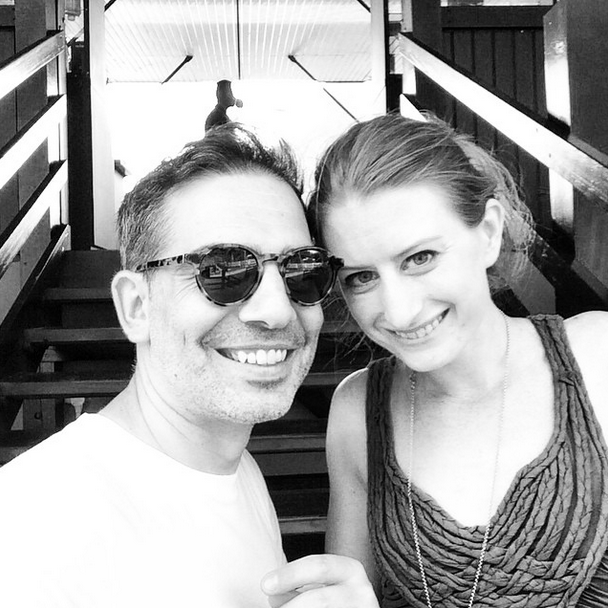 I was headed to Athens to spent a few days in the company of 800 travel bloggers at TBEX. 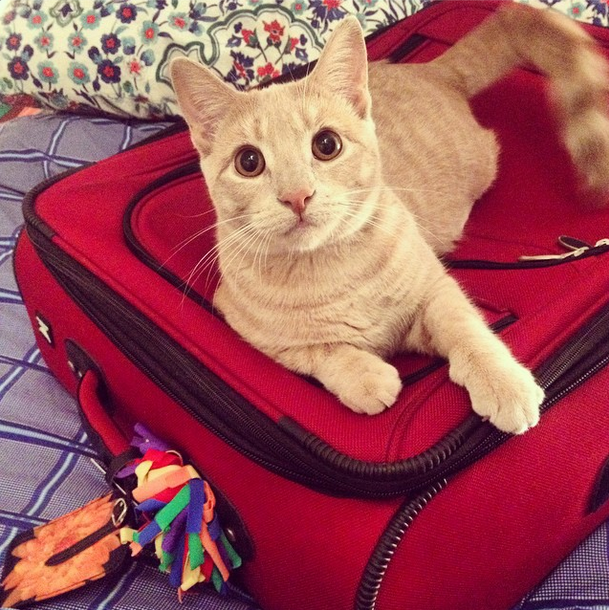 Oakley likes to sit in or on my suitcase. He also likes to play with the pom pom on the handle. His eyes in this photo say it all. 20. Athens after the rain. There were a few pretty impressive rainshowers while I was in Athens. In fact, a BBC video showed some cars floating down a street. I didn’t see anything that bad, but I took this photo about 10 minutes after a downpour. 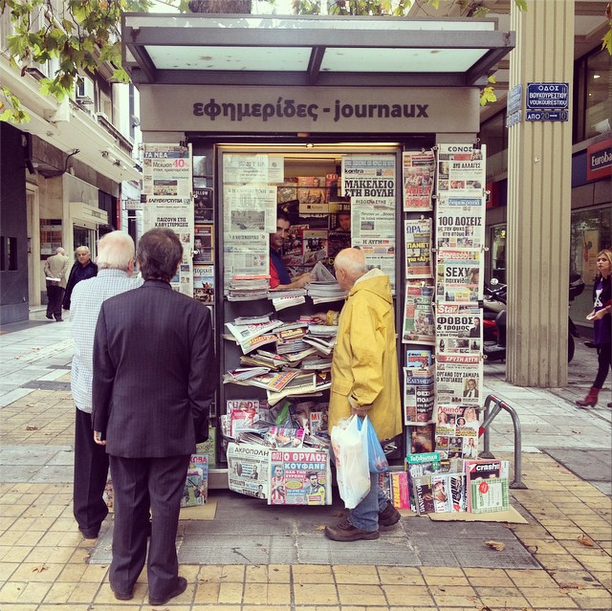 I’m always fascinated by newsstands, the many different languages represented and the people who still buy paper newspapers. 21. 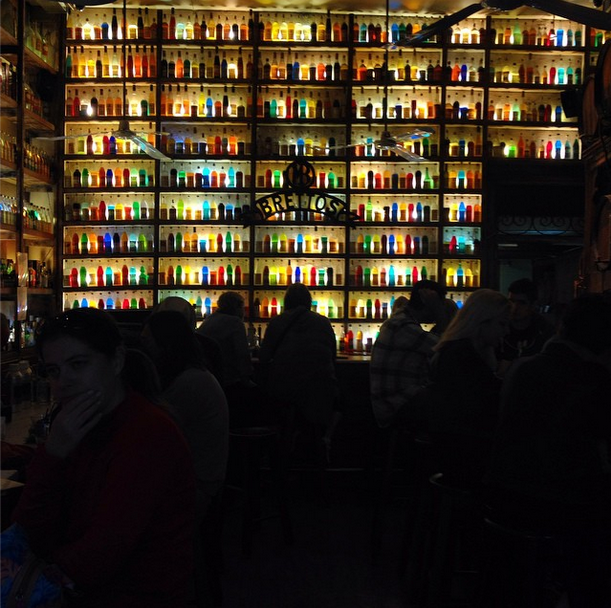 Brettos in Athens. I didn’t actually hang out in Brettos so I can’t tell you too much about it, but my mom text me on my way out one day and said to see if I could find it because she said it would make a cool photo opportunity. I actually bumped into it at random later that afternoon and she was right! This is the view from the doorway. 22. 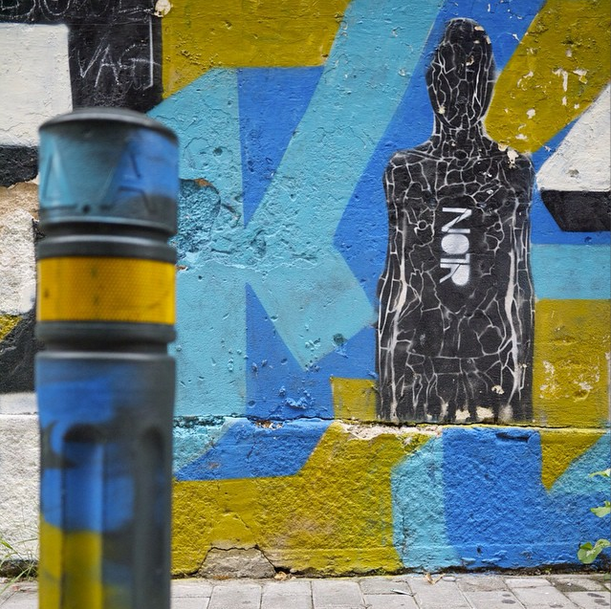 Textures of Athens. I’m always drawn to walls of peeling paint, bright colours and wayward branches. These are things that tell stories. This wall was up in Plaka not far from the Acropolis, an area of narrow alleyways between mostly white-washed homes (some spaces so narrow you almost have to walk sideways to pass). 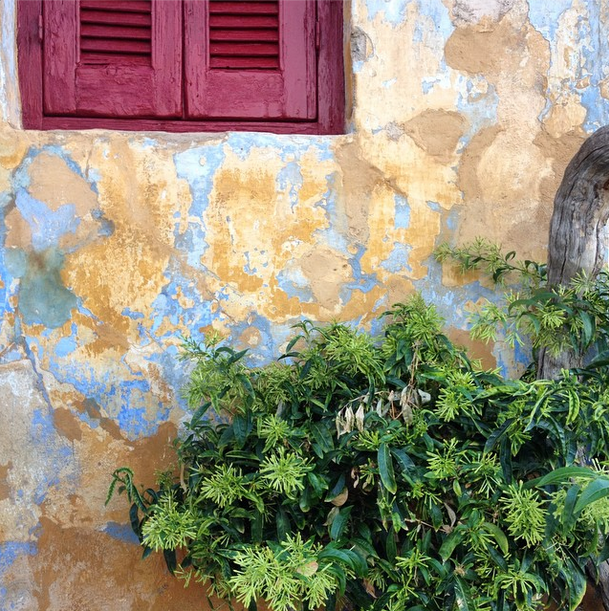 I loved the combination of red shutters, worn out walls and a slice of nature. 23. 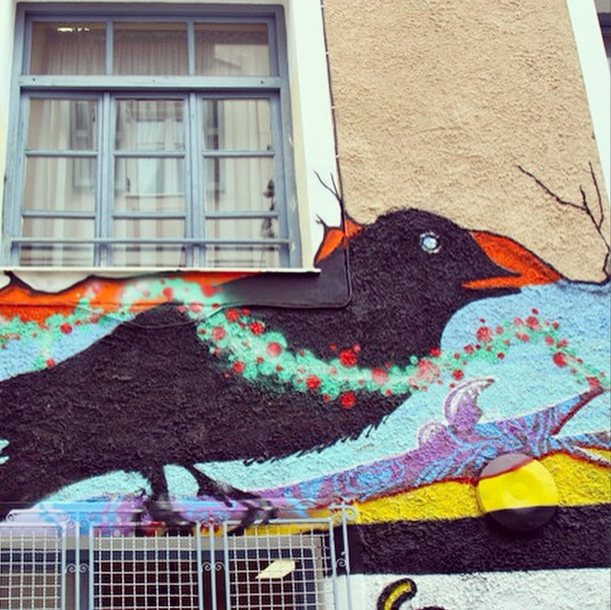 Street art in Athens. Wow, what a city for street art! In certain areas, it’s around every corner. There are a lot of messy tags (scrawled over just about every surface in some parts of the city) but there’s a ton of talented artwork as well and it’s not difficult to find. This was one of a series of animals painted on the long wall of a school. 24. 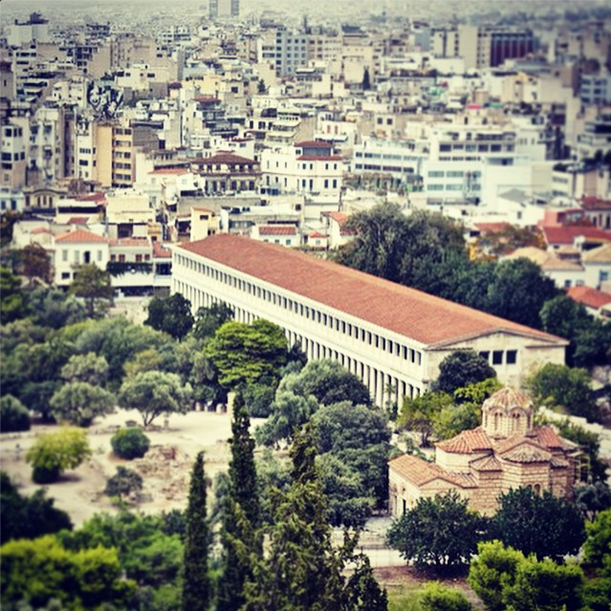 Density of Athens. I climbed up above the city on the way to the acropolis (where I decided not to go on this visit because I had been previously and there wasn’t much time). I did go far enough to be able to look down on the city, though, and was amazing at the incredible density that stretched out into the horizon. So many places to explore, so little time. 25. Street vendor in Athens. 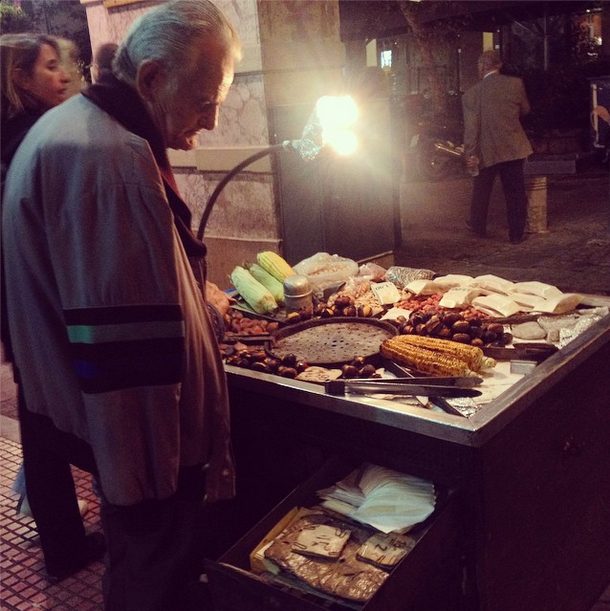 Walking back to my hotel one night, I spotted this guy selling roasted chestnuts and corn under the light of a desk lamp on the corner. 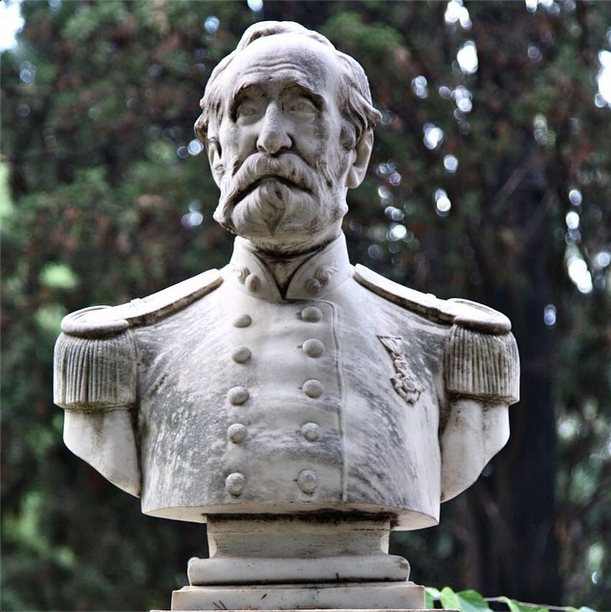 He looked pretty solemn and I wondered about his life story, how he ended up there, whether the crisis had anything to do with it and where and who he goes home to at night. 26. First Cemetery, Athens. I’ll be sharing some more photos of the First Cemetery soon. I always enjoy visiting cemeteries when I travel. In St. Lucia, we found pink gravestones. In Paris, I saw Oscar Wilde’s lipstick-kissed grave. In Athens, many photographs of the dead, some intricate and colourful tiling and plenty of stray cays sleeping on top of the tombs. 27. Colourful streets of Athens. Athens is certainly not a dull city. The examples of creativity that cover the streets is inspiring and I’m already dying to return to capture more of it. I mainly walked around Plaka and Psyrri. I believe that Metaxourgeio and Gazi are full of street art as well and I’m sure there are many more neighbourhoods brightened up by these artists. 28. Salepi seller in Athens. Four years ago, I went to Athens with my dad on our way to Kardamyli for our olive picking adventures. The night we had in Athens before the drive down, we bumped into a street vendor with a curious cart. 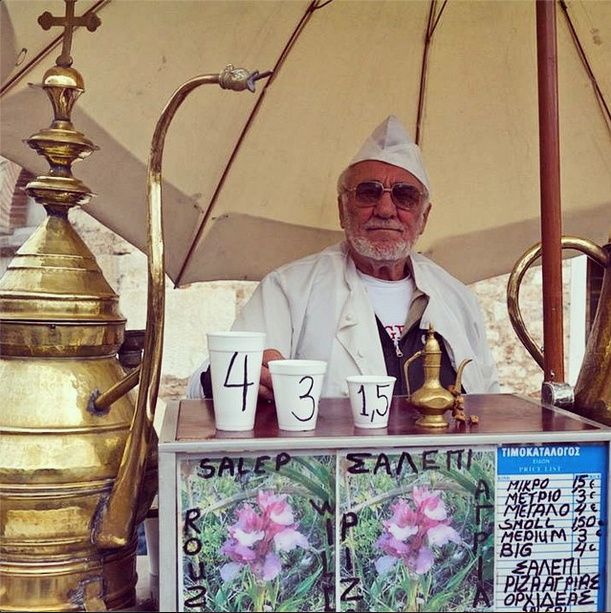 He was selling this hot, thick drink called salepi, which is made from boiling the powdered root of orchids. I believe it’s popular in Turkish culture as well. Anyway, we tried some and it was definitely one of the most unusual drinks I’ve consumed. It was funny to bump into the same exact vendor so many years later and once again order a drink from him (although I think my memory of it was a bit skewed because it didn’t taste as great as I remember it!). 29. 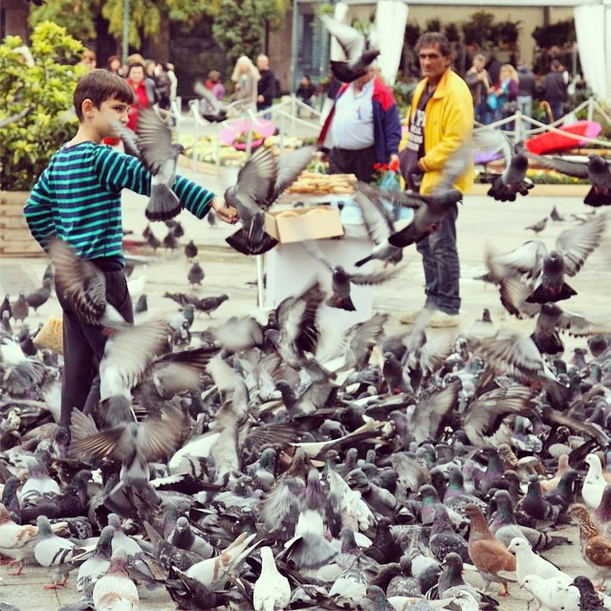 Feeding the birds in Athens. This little boy had a bag of crumbs with a hole at the bottom, allowing them to leak out slowly. Immediately pigeons flew in from all over the square and piled at his feet in a mess of feathers fighting for their lunch. One thing is for sure; he is braver than me! You’ll also see in the background a cool umbrella garden installation. 30. 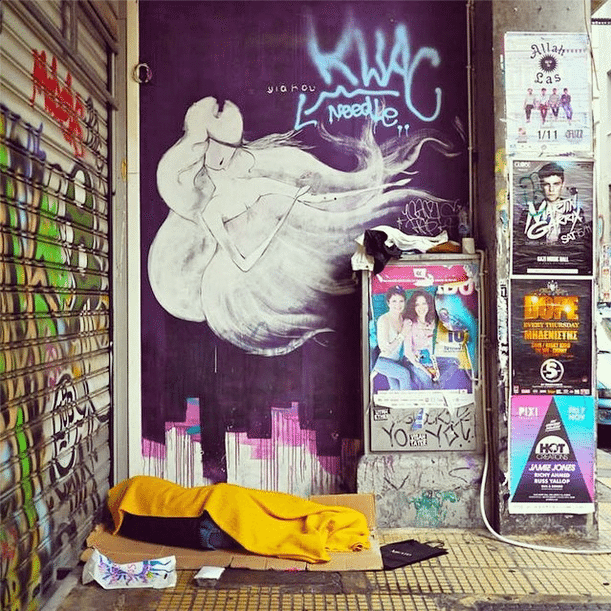 Rough sleeping and steet art, Athens. Unfortunately there are quite a few rough sleepers in Athens (as there are in pretty much any city). I thought this was an interesting composition, this man sleeping beneath what could be some sort of street art angel. Makes me wonder if it has anything to do with the reason he chose that spot to lay down his cardboard box. For more, follow me @LittleObservationist! 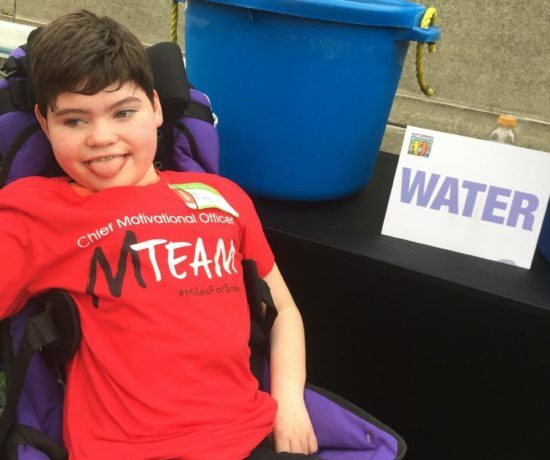 Running for The MTeam: Please Donate (& Print Gift)!